I know all the details about this V9 push not because he was pushing a sale but because I was peppering him with questions because I’m fascinated as to how a guy like him is making a go of it with all that we hear about the challenges of working with Piaggio. 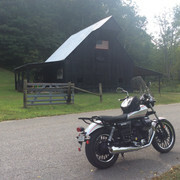 Rose Farm, C&D, Cleveland Moto are all dealerships withing 400 miles of him who’ve hung it up recently. He’s got a bride and small kids, he’s a sharp guy with no doubt lots of options and yet, he’s hanging his hat on Moto Guzzi. While I admire Cadre devotion & commitment, judging by all of the dealers that at one time carried Guzzi and no longer do or who are no longer even in business, his business model does not bode well for their longevity. I wish them the best, maybe the V85 will save the dealers! 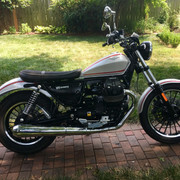 Buying three of our four Guzzi's from Cadre, I can't speak highly enough for the integrity and quality of the team at Cadre. That is why I was confident buying a Guzzi from Sloan's in Murfreesboro. Moto Guzzi is just one of the 13 brands they carry. They only need to sell the minimum required a year to keep carrying them. They also carry all the other Paggio products. Oh crap. Tell me it isn't so ! I still have Upstate New York on my bucket list ! Well - the new "herd" of leftover motorbikes are still "in transit" as of this morning. I hate elevator music ... but it’ll be worth the wait! The roamer does have a nicer look than the bobber and a more relaxed riding position. Sloans has a leftover bobber but no roamer to test ride. I still think that if I add a third bike to my stable it will have more dual sport capability. I just think the Roamers are straight up gorgeous motorcycles. But, the weather has been really [censored] so it's not really cutting into my riding time. THIS weekend is another two rounds of rain/sleet/snow. For those that haven't been to Carde's here is a little web spot i put together for them in 2016.